Updated 1/20/2018 Recently, I won this cel from a dramatic moment in Cardcaptor Sakura, showing the magical protector Yue holding an unconscious Touya at the start of Sakura’s final trial in Ep. 69. Within hours of placing the winning bid, I had grave doubts about the authenticity of this cel, and now, having inspected it in person, I can say that it is indeed a well-executed forgery. Well, so be it: I have plenty of genuine CCS cels from key moments, and the price I paid for this one, while not peanuts, also was nowhere near what I have paid for my highest-end items. And it gives me a chance to look closely at this piece (which is still a well-executed work of art) and compare it to real production art, defining more tightly the qualities that should raise flags of caution for buyers or, conversely, assure owners that what they have is the real, one-of-a-kind item. This cel looks pretty good at first glance, with nothing that immediately raises a warning flag. 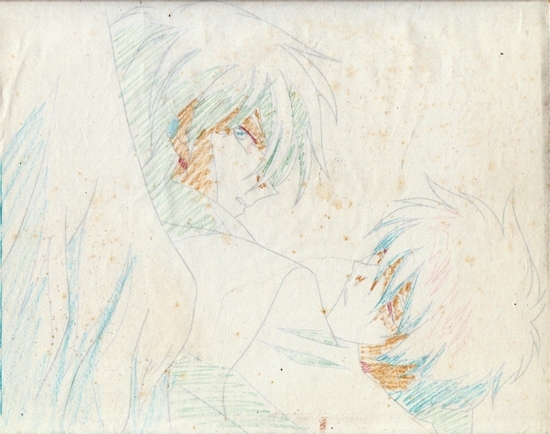 And it came with a matching douga (see thumbnail), which is often a token of authenticity. But, if the sketch and cel match, and the cel is a forgery, then the sketch is also a forgery. (More about this sketch later). After the series of cels I’ve listed above, Yue blinks, and, holding Touya steady where he is, he lifts his head and neck a little and turns around a little to look behind him, where the magical battle is starting. He says one word (again, “Clow!”) and the cut ends with the image in the suspect cel. 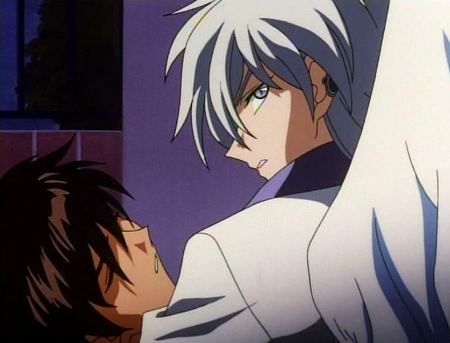 But that means that the sequence number would be identified as “END” or “E.” And it probably would have been on at least two layers, one for Yue’s mouth layer for bit of dialog. There is some distortion overall in any such "flicker," a factor of the different ways in which the frames were imaged and compressed for TV screens. But notice that the lines do not match up at all. A shadow on Yue’s arm extends onto his back on the screen cap, but stops short on the cel. The two strands of hair over his nose are different sizes. The shadow line of the big hair strands on the left and right are visibly different. Even allowing for the distortion, the two simply do not match up. A19 END: owned by kamidake cel gallery. Notice that the genuine A19 layer, as predicted, is labeled “END” and lacks the mouth layer visible in the screen cap, which would have been on a top B-layer. 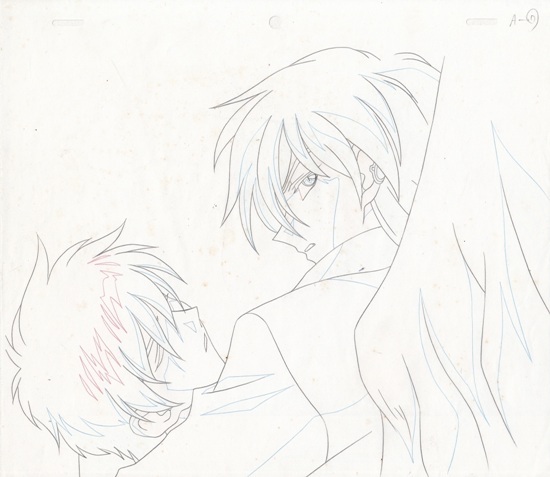 The sketch that came with the fake cel is, to expert eyes, a plausibly genuine douga, with no sign of shaky tracing or any other obvious sign that it was copied from a screencap. But ... the same issues that bedevil the cel also damn this sketch: the shadows on Yue’s arms are too short and the locks of hair in front of his face are too long. The questioned cel clearly was made from this douga, but neither one passes the flicker test. There are three additional features that are peculiar. Individually, they are not as damning, but collectively they support this judgment. 1. Shading to indicate highlights and shadows. One of the features of a douga is to signal to the cel painter when to use normal coloring (as defined in the settei or setting materials) and when to use the “highlight” or “shadow” variations. 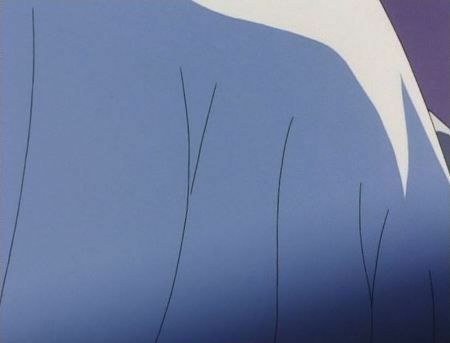 In cel-based animation materials, these are normally worked out at the genga stage, with highlights shaded in yellow or orange and shadows shaded in blue. But in the suspect douga there is no shading on the front. When I turned the sketch over, I found the shading on the back (see second thumb). [The shading is actually so faint that it can barely be made out; this scan has been artificially darkened to make its extent more clearly visible.] That became the standard with dougas for CGI-era series, in which the front side would be scanned and then colorized digitally by a technician with the aid of the shading on the back. You can see a number of these sketches, scanned front and back, in the CGI section of my gallery.
. . . that signals potential trouble. Now the added dash doesn’t automatically mean the douga is fake, but it is odd, the sort of thing that a person who is not familiar with Japanese studio practice might do without thinking. The first thing that is striking about authentic CCS sketches is how grubby they are. You can see blots and streaks of paint, some probably dripped on it by the cel painter, others probably left when it was shipped back to the studio in direct contact with its freshly painted celmate. And looking closely at the lines of the sketch, one can see places where the graphite, and in places, the surface of the paper has been lifted off when the cel and sketch were at some point separated. All of that is physical evidence of the douga’s use as a reference for the creation of the cel and afterwards as a buffer to protect the cel from sticking to its sequence-mate in the finished stack. The challenged douga also looks grubby, but in a different way. Look at this detail from a blank portion of the paper. You can see what conservators call “foxing,” the yellowing and spotting of the paper caused by poor treatment and especially high humidity conditions. Could the cel and douga been stored carelessly for over a decade, leading to this condition? Ah, but that careless storing would also have made the cel sheet oxidize and the trace lines fade dramatically. And the challenged cel is in fine condition with clear acetate and sharp trace lines. No, it looks to me as if the douga has been artificially aged, by dampening it slightly and leaving it in a warm environment long enough to let mold begin to grow, causing the distinctive spots.  The typical damage caused by paint spotting and rubbing against the cel, by contrast, is completely absent. The lines of the sketch itself are in good shape -- too good, in my opinion. Without knowing more about the provenance of this cel and sketch, it’s difficult to say for sure what it is and how it came into being. 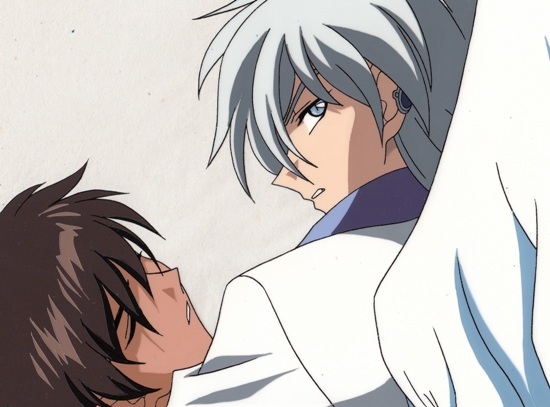 It’s enough to say that it certainly was not produced by Madhouse during the production of CCS and did not contribute to the making of the broadcast scene it purports to show. But from the above I think it quite possible that the douga was crafted by an animator with studio experience, perhaps even experience with CCS. 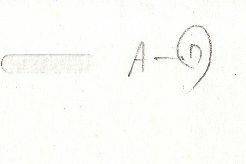 The artist knew enough how to make the sketch look right, and possibly followed his or her normal practice in giving it a sequence number with a dash in the middle. Also, the creator knew that, to pass the normal eyeball test of authenticity, the sketch needed to have a certain distressed look. Verdict: Not authentic, but a thoughtful, carefully constructed effort, worth keeping as a caution for the future and as a well-crafted tribute to this memorable scene.